So your posting all your valuable event data to Loggr. Your data is safe and accessible through our tools, but you own your data and we know how important it is to have full control and access to it. Whether you want to integrate it into other business applications, perform deeper analysis, archive it or simply move it to a different service, we make it pretty easy to do. There are a couple ways to execute queries with Loggr. One of the tools we provide for digging through your events is a custom query language. We call it the Loggr Query Language (or LQL). It’s a very simple language similar to SQL that can be used in our API or within the query editor on the website. 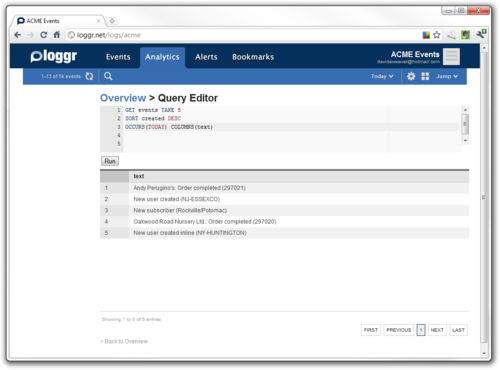 You can also run queries through the Loggr Web API using the Query endpoint. The TABLE keyword allows you to specify what kind of record you are querying. Currently we only support events and users. Depending on which table you specify the query behaves slightly different. If you specify events then you can use a dot notation to specify the class of events you want to query. Event classes are setup by your log's admin. (See Classes for more details). Results for events are returned based on the created date of the event. If you specify users then there isn't classes available, so just leave off the class_name. Results for users are returned based on the first activity date for the user. This clause is very similar to SQL. It allows you to specify criteria to filter your records. You can filter on most fields of events and users. These clauses allow you to page the results. Since Loggr only allows a maximum of 500 results to be returned with a single query, retreiving more records will require multiple requests. Use paging to get all records for a large query. The value specified for TAKE will be the page size. The default value for TAKE is 100. For example, 'TAKE 10' will return up to 10 records. The value specified for SKIP is the number of pages to skip (NOT number of records). For example, if you use 'TAKE 10 SKIP 3' the records returned will be 21-30. To specify how your records are sorted use the SORT clause. SORT accepts a field name and an order, specified with ASC or DESC. The key will reflect the keyword or field you grouped by. This clause lets you specify the time over which your query runs. The best way to explain is is by using some examples. The query will always assume the earliest date is the start of the timeframe, even if you happen to switch them as parameters. You can change which field is used for filtering by date by preceding the OCCURS keyword with a field name. By default, the query will choose the field on which the OCCURS filter is applied. This is optional, but if supplied, it must be a date type. This clause enables you to specify which fields you want returned in your results. They can be any field listed in the tables above (specific to the TABLE type you request). Or if you are doing a GROUPBY query, the fields are KEY, COUNT, AVG, SUM, MIN, MAX. Be sure to respect the case of these fields. They will not work using lowercase characters. It is helpful to specify columns to reduce the size of the result set. There are some limitations that we impose to make sure our service is able to handle all user's request. 1. Request can return a maximum of 500 records. By default, the page size is 100, but using the TAKE clause you can set the max to 500. To return more records than 500 you will need to make multiple requests, using TAKE and SKIP to specify which page of records you want. 2. Requests can not span a period of time greater than 30 days. Again, if you need to span a greater time period, please use paging as described above. Some examples. First, to get the text from the last 5 events added to your log. This next example uses a WHERE clause to get the last 5 events that have text matching ‘New subscriber’ exactly. Using the same query above, but replace the exact match on text with a regex match clause LIKE. Also, this time we’re going to return just the KEY for the event which we can use to call into the API for more specifics about the event. The following queries based on a set of tags. It also return the created date and geo info for each event. You can also include boolean operators in the WHERE clause. Finally a more complex example showing how you can query for aggregate information and specify time ranges. This query gets the sum of all events of class ‘order’ having the tag ‘online’. It uses the OCCURS clause to get the aggregates over the last 7 days. It will return the results as a list of 7 records for each day in the query. Each record will contain the KEY (in this case, the date) and the SUM. If you want to get specific dates, you can include them in the OCCURS clause instead of the keywords shown above.